Sun., July 23, 2017, 8:57 p.m.
LOS ANGELES – Clayton Kershaw left after two innings with lower back tightness that is sending him to the disabled list, and the Los Angeles Dodgers overcame a blown save by Kenley Jansen to beat the Atlanta Braves 5-4 on Sunday on Logan Forsythe’s bases-loaded single in the 10th. Kershaw, unbeaten in 15 consecutive starts, came out after 21 pitches. He was headed for scans and declined to compare his current situation with last year, when he was out 2 1/2 months with a herniated disk in his back. Jansen entered with a 3-1 lead and got the final out of the eighth, then gave up a tying three-run homer to Matt Adams in the ninth. Forsythe singled after Cody Bellinger was intentionally walked by Jim Johnson (6-2) to load the bases. Brandon Morrow (3-0) retired the side in the 10th. 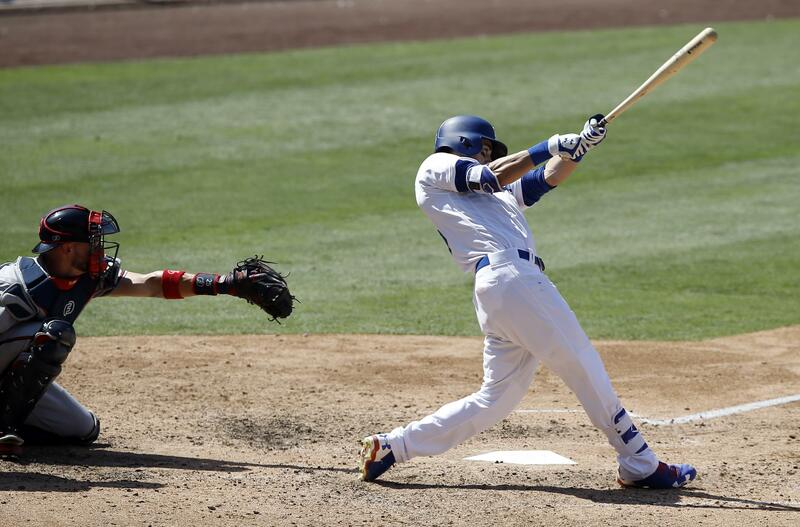 Austin Barnes hit a three-run homer in the fourth for the Dodgers and Cody Bellinger hit his 27th of the season in the eighth. PHOENIX – Stephen Strasburg left with a 5-0 lead after the second inning, when he walked the No. 8 and No. 9 batters. He is 10-3 with a 3.25 ERA. Strasburg said his early departure was a precaution. He described the problem as slight “achiness” in his forearm. Strasburg said he wants to “nip it in the bud” so he’s available to the team in the crucial stages of the late season. Brian Goodwin’s leadoff homer ignited a four-run first inning off Robbie Ray (9-5), who lasted five innings, allowing five runs. Bryce Harper singled in the first to extend his hitting streak to 16 games. Joe Blanton (1-2) got two outs and earned the win. CHICAGO – Willson Contreras hit a tiebreaking two-run homer, Jose Quintana won again and Chicago beat St. Louis to move into a virtual tie for first in the NL Central. Kyle Schwarber also connected as the Cubs won for the eighth time in nine games since the All-Star break. The World Series champions improved to 51-46, just a few percentage points ahead of Milwaukee after the Brewers (53-48) lost 6-3 at Philadelphia. Quintana (6-8) struck out seven in six innings in his first home start since he was acquired in a blockbuster trade with the White Sox on July 13. He pitched seven sparkling innings in an 8-0 victory at Baltimore in his Cubs debut last Sunday. Coming off his first career shutout, Michael Wacha (7-4) was charged with five runs and six hits in six innings in his first loss since May 30. Wade Davis finished for his 20th save in 20 chances. SEATTLE – New York won a series for the first time in six weeks when Aroldis Chapman struck out Ben Gamel with a runner on to preserve the Yankees’ third win in four games against Seattle this weekend. The Yankees had been 0-8-2 in series since sweeping Baltimore on June 9-11. After Seattle overcame a 3-0 deficit with a four-run fourth inning against Caleb Smith, Brett Gardner hit a tying, bases-loaded single in the sixth and Clint Frazier followed with a two-run double off former Yankee James Pazos (2-3). Didi Gregorius had his first career multihomer game with solo shots, and Gardner opened the game with his 17th home run. A converted starter pitching on consecutive days for the first time in big league career, Chad Green (1-0) struck out three in 2 1/3 perfect innings. Chapman had another shaky finish for his 11th save. ST. PETERSBURG, Fla. – Rougned Odor homered twice, including back-to-back drives with Carlos Gomez in the eighth inning, and Texas completed a three-game sweep. Odor’s two-run drive off Brad Boxberger (2-2) tied the score, and Gomez put the Rangers ahead 6-5 two pitches later. Joey Gallo also homered for the Rangers, who had not swept a series of three or more games at Tampa Bay since July 1999. Adrian Beltre tripled and singled, moving within 11 of 3,000 hits. Matt Bush (3-4) pitched a scoreless seventh, and Jose Leclerc got his second save despite two walks in the ninth. CLEVELAND – Corey Kluber (8-3) struck out a season-high 14 in 7 2/3 innings, and Cleveland finished a three-game sweep. Kluber allowed five hits, including Kevin Pillar’s home run, and reached double figures in strikeouts for the ninth time in 16 starts. Michael Brantley hit a two-run homer in the sixth and had three RBIs. Brandon Guyer’s three-run double was the key hit in the first, when Cleveland took a 4-0 lead against J.A. Happ (3-7). NEW YORK – Rookie Matt Chapman quickly atoned got getting picked off at third base by hitting a tiebreaking home run in the seventh Rafael Montero (1-7). Rookie Daniel Gossett (2-5) gave up two runs and five hits in six innings, and Santiago Casilla worked the ninth for his 16th save, ending New York’s four-game winning streak. CINCINNATI – Scooter Gennett, Eugenio Suarez and Tucker Barnhart homered, and Billy Hamilton had three hits and stole a pair of bases to increase his major league-leading total to 43. Cincinnati finished a 2-8 homestand in which they allowed 23 homers and 72 runs. Rookie right-hander Sal Romano (2-2) made his fourth and longest big league start, allowing one run and three hits over six innings. Raisel Iglesias gave up one hits over two innings for his first save since July 9, his 17th this year. Tom Koehler (1-5) gave up six runs – five earned – and nine hits in 5 2/3 innings. BALTIMORE – Zach Britton pitched a hitless ninth tp set an American League record by converting his 55th consecutive save opportunity. Britton broke the AL mark held by Tom Gordon, who notched 54 straight saves with Boston from 1998-99. Britton started his run on Oct. 1, 2015, added 47 in a row last season and is 6 for 6 this year. The major league record of 84 is held by Eric Gagne of the Dodgers from 2002-04. Baltimore broke a tie with two runs in the eighth against Luke Gregerson (2-3), using a sacrifice fly by Manny Machado and an RBI single by Jonathan Schoop. Britton made the lead stand up, using 16 pitches to retire the A.L. West leaders. Mychal Givens (7-0) worked the eighth for the Orioles. PHILADELPHIA – Nick Williams hit a go-ahead, two-run homer in the fourth off Junior Guerra (1-4). Jerad Eickhoff (2-7) allowed three hits in six innings and Howie Kendrick had two hits and two RBIs. Luis Garcia pitched a perfect ninth for his first save this season. The Phillies have won consecutive series for the first time since late April. MINNEAPOLIS – Jose Iglesias had three hits, including a tiebreaking, two-run homer in the seventh off Trevor Hildenberger (1-1) in a 4-hour, 19-minute game – the longest nine-inning game in Twins history. Ian Kinsler, James McCann and Alex Presley also had three hits apiece for the Tigers, who took two of three from the Twins. Matthew Boyd (4-5) won his second straight start since he was recalled from the minors, striking out a career-high eight in six-plus innings. KANSAS CITY, Mo. – Brandon Moss hit a game-ending double off Tyler Clippard extending Chicago’s longest losing streak in since 2013 to nine games. Kelvin Herrera (3-2) struck out two in a perfect ninth, extending the scoreless streak by the Royals bullpen to 18 innings over five games. DENVER – Kyle Freeland (10-7) allowed two runs over six inning in his first start since his no-hit bid against the Chicago White Sox on July 9 was broken up by Melky Cabrera’s one-out single in the ninth. Between the starts, Freeland threw three hitless innings against the Mets on July 15 in his first career relief appearance. Trevor Story, pinch-hitter Pat Valaika and Mark Reynolds hit two-run homers during a seven-run sixth. Ivan Nova (10-7) allowed a season-high seven runs and nine hits in five-plus innings. ANAHEIM, Calif. – Luis Valbuena hit a tiebreaking solo home run in the seventh off Rick Porcello (4-13), and Mike Trout and Andrelton Simmons also homered. Parker Bridwell (4-1) gave up two runs on five hits in seven innings. Bud Norris earned his 15th save when Xander Bogaerts hit into a game-ending double play. SAN FRANCISCO – Wil Myers homered for the third straight game against San Francisco, and Jabari Blash hit a go-ahead two-run double in the decisive fourth to back Dinelson Lamet (4-4). San Diego hit three straight doubles in the fourth and four consecutive hits in all against lefty Ty Blach (6-6). Brad Hand, the Padres’ third reliever, pitched a 1-2-3 ninth for his third save. Published: July 23, 2017, 8:57 p.m.